A backwashing filter is a water filter that cleans itself periodically by rinsing away impurities it has filtered from water. Although a backwashing filter may look like a water softener and be the same size, it's a different animal. Softeners are "ion exchangers", not filters. A backwashing filter is a simple device that consists of a large tank called a "mineral tank" that is filled with a filtering substance called a filter medium. (The plural is media.) Water enters the top of the tank through a special control valve and passes downward through the medium, which removes impurities and holds them. Some media do not hold impurities, but cause a change to occur. Calcite, for example, dissolves and in the process increases the pH of acidic water. The treated water then enters a tube at the bottom of the mineral tank, passes upward through the tube (called a riser), and exits the filter via the control valve. When the filter medium is saturated with contaminants, the control valve initiates a backwash. The backwash is an operation in which water passes backward through the filter at a rapid rate. It enters the tank at the bottom via the riser tube, then passes upward through the filter medium, exiting at the top, via the control valve. The rapid upward flow, in addition to washing away stored impurities, fluffs and resettles the medium bed, preparing it for another filtering cycle. Filter media are selected according to purpose. Some of the most common are Birm (iron removal), Filter Ag (sediment removal), Calcite (increase pH of acidic water), KDF55 (chlorine and lead removal), KDF85 (iron and hydrogen sulfide reduction), Manganese Greensand (iron and sulfide removal), etc. Some media have numerous applications, like the very useful and widely used GAC, or Granular Activated Carbon, which is used to remove chlorine, the by-products of chlorination, pesticides, herbicides, and chemicals in general. GAC, following proper pretreatment, also removes iron and hydrogen sulfide. It comes in various formulations made from a variety of materials (bituminous coal, coconut shells, wood, etc. ), each with its own special properties. Centaur®, a specially processed version of GAC, is aimed at special problems like chloramines in city tap water and iron and hydrogen sulfide in well water. This site includes a useful Filter Media Guide and a second guide that gives flow and backwash features of the various media. Choosing a backwashing filter can be a simple or a complex issue. You should not expect a backwashing filter to be a magic, one-step solution to any problem. Often, in fact, it is the final stage of a more complex treatment system. Below is a brief problem-oriented suggestion list. It will give you a place to start. The standard medium for removal of chlorine, both free and combined, and for the enhancement of taste and odor in city tap water is granular activated carbon (GAC). Centaur®, a specially prepared carbon, is designed for effective removal of chloramine. KDF55, an excellent long-term remover of free chlorine, is not effective against chloramine or combined chlorine. It is often mixed in small quantities with GAC to enhance its performance. Unfortunately, there isn't a practical way to get significant, dependable fluoride reduction with a residential backwashing filter. Activated Alumina, the most commonly used medium for fluoride removal, requires very low flow rates and must be used in large quantities. These problems make it impractical for use in standard "whole house" filters. Although reduction of fluoride by standard GAC is not claimed by manufacturers, the reality is that carbon often reduces fluoride. Although fluoride reduction by carbon filtration may depend on many variables (pH, mineral content of the water, etc.) that make performance uncertain, a good carbon filter is probably your best bet for fluoride reduction in city water. We can't promise it, but it often works. For general chemical reduction — removal of pesticides, herbicides, etc.— carbon (GAC) is the standard. Filter carbon is made from a variety of substances, the most common being bituminous coal. Coconut shell carbon is generally regarded as the medium of choice for the removal of chlorine, chlorinated solvents, or Volatile Organics. Centaur® carbon is specially prepared for the reduction of chloramine. "Hardness" is an overabundance of calcium and magnesium. It is removed by a water softener, which is an ion exchanger, not a filter. Go here to see water softeners. You should not simply purchase a filter with “iron removal” media and expect it to solve your iron problems. Although a simple Birm filter is sometimes all that's needed, iron removal often requires pretreatment by chlorination or aeration or some other oxidization strategy. 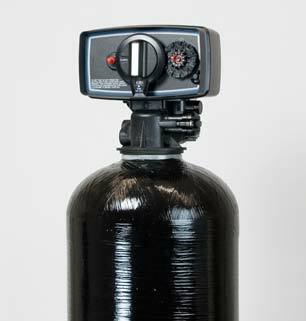 In many cases, a common water softener is a great iron removal tool. A free-standing birm filter will usually work quite well to remove a reasonably small amount of iron if your water has a pH of 7.0 or higher and there is sufficient dissolved oxygen in the water to be treated. If pH is low, an ordinary water softener may be your best choice for removal of small amounts of iron. Small amounts of hydrogen sulfide, the noxious gas that produces the “rotten egg” smell that wells are sometimes plagued with, can be removed by carbon filters and KDF/carbon combinations. If the problem is significant, you'll get best results by oxidizing the contaminant with aeration or chlorination before filtering with carbon. Most standard filter media (carbon, birm, etc.) will provide good filtration of larger particles, 20 microns and larger. Filter Ag is a particularly good medium, being light and easy to backwash. For the very best in sediment removal, Multi-Media filters, or filters using a natural Zeolite are superior. Zeolite, if properly sized, can filter down to <5 microns. “Hardness” is an overabundance of calcium and magnesium. It is removed by a softener, not a filter. Go here to see water softeners. It can also be “sequestered” by the feeding of phosphate into the water stream, greatly reducing its ability to damage plumbing fixtures. Filters are not designed to make water contaminated with bacteria safe to drink. For that, you need a chlorination system or an ultraviolet system. Our most popular backwashing filter in a convenient size that fits most residential situations. Includes a variety of filter sizes. All filters have Fleck control valves.